← Did You Notice the Changes? 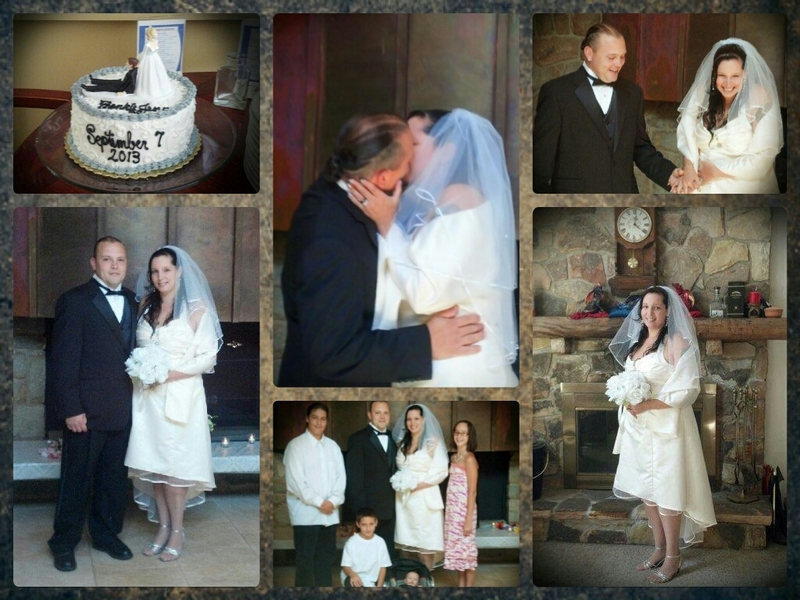 On September 7, 2013, residents Frank Gonzalez and Jennifer were married at the Community Center. The ceremony was performed by former Delaware Water Gap Mayor Frank Brown and attended by the couple’s four children and a few family friends. Frank and Jenn met on Staten Island in 1992 and dated on and off for about three years before losing touch for more than 16 years. They were introduced to each other by their mutual friend Cass, and it was through his Facebook page that they reconnected. They reunited and Frank moved in with Jenn and her 3 children in Long Island. Frank and Jenn both enjoy drinking Jack Daniels, so it was on a trip to the Jack Daniels Distillery in Lynchburg, Tennessee that Frank proposed marriage. They were in the private Tennessee Squire room at the distillery, along with master distiller, Jeff Arnett, when Frank dropped to one knee and produced Jenn’s grandmother’s ring to seal the deal. About two months later, and only days after finding out that Jenn was pregnant with what would be her 4th child and Frank’s first, Hurricane Sandy caused so much damage to the home they were renting that the landlord refused to make the repairs. Coupled with the fact that Frank was a first responder during the September 11, 2001 attacks in New York, they decided it was time to leave New York for good. In February 2013 they began shopping for a place to live in our area. On Easter Sunday, Frank and a very pregnant Jenn brought their children and pets and moved into Emerald Lakes. Once they were settled in, and after Jenn gave birth to Gunner, they began planning their wedding at the ELA Community Center. The ceremony was witnessed by Cass and his wife Melanie who, interestingly, were introduced by Jenn many years back. Also attending were Jenn and Frank’s children; Maverick, Leilani, Hunter and Gunner. So, we here at ELFP would like to extend our best wishes for a long and happy marriage and a big welcome to the community to our neighbors and newlyweds, Francisco and Jennifer Gonzalez. Posted on October 14, 2013, in ELA Events and tagged Emerald Lakes, Emerald Lakes Association, HOA, Homeowner's Association, Jack Daniel, Jack Daniels Distillery, Long Island, Lynchburg Tennessee, New York, Staten Island, Tennessee, wedding. Bookmark the permalink. Leave a comment.